Former Dean of the Busch School of Business from September 2016 to December 2018, Bill now serves as a Clinical Associate Professor at the school. Bill has been involved with the School of Business as a Research Assistant Professor and member of the Advisory Board of the MSBA program. Bill has led companies as President or CEO for over 25 years. Bowman is currently the President and CEO of Core Values Group LLC in Boston, a consulting firm that works with employees to help them grow in the human virtues most important to their organization’s success. 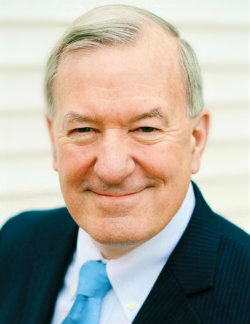 Previous to launching Core Values Group, Bill was President and CEO of US Inspect in Chantilly, VA. US Inspect is the nation’s largest home and commercial inspection company. Before that, he served as President of ChildrenFirst Inc. (now Bright Horizons), the nation’s leading provider of backup child care services to corporations. Bill brings deep experience in developing organizations through three past entrepreneurial ventures. In 1982 he co-founded Spinnaker Software Corporation, one of the nation's first educational software companies. After selling Spinnaker to The Learning Company, Bill began the operations of Logal Software, Inc., another educational software company where he served as president and which he helped take public in 1996. His third venture was also in the educational field. In 1978 he co-founded The Montrose School, an independent day school for girls in grades six through twelve located in Medfield, Massachusetts, and voted in 2009 as one of Boston Magazine’s Top 10 Private Schools. He served as Chairman of the Board of Trustees for ten years, recently stepping out of that post but remaining a Trustee. Bill also worked for the Boston Consulting Group, and for the United States Public Health Service, and was appointed by the Governor as a Trustee of the five campuses of the University of Massachusetts, remaining on the board for six years. He was the co-founder of the Massachusetts Software Council, past Chairman of the software Publishers Association, and a former Director of the Massachusetts High Technology Council. Bill is an engineering honors graduate of Northwestern University and received an MBA with distinction from Harvard Business School. He is married to Leigh Bowman and they have nine grown children.